As you all know, ballet flats are a staple of mine. I wear them at least four times a week, and my collection ranges from classic black to neons to printed pairs like these. However, they all have one thing in common: a round toe. No pointed toes here. When I spotted this Rebecca Taylor pair yesterday, I realized that it might be time to invest in a pair of points. It’s a classic shape, and it feels so feminine (very Audrey Hepburn in Funny Face). Loeffler Randall is the queen of the pointy toe flats. They have so many adorable options – like this polka dot pair. How do you feel about the point? Yay or nay? I love this style of shoe for work! I work downtown and I walk A LOT! So the low heel is perfect but the pointed toe adds the dressy factor. 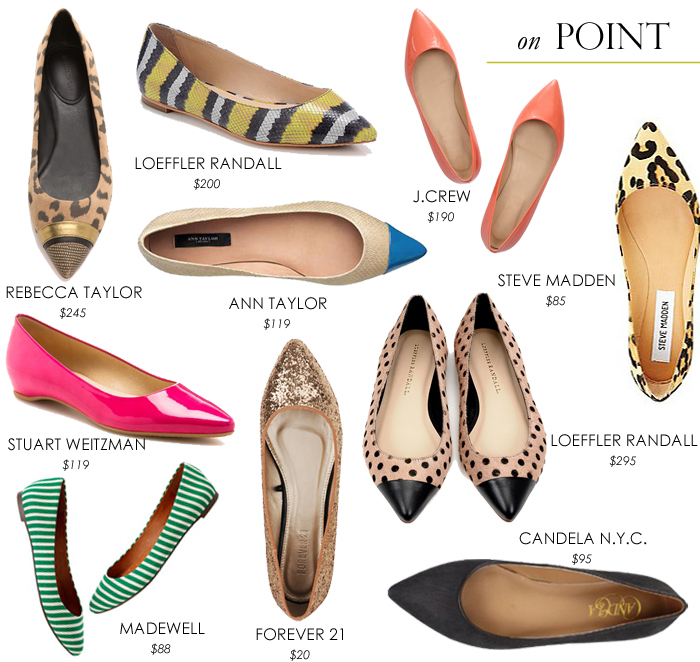 I love a pointed toe flat! They give you the comfort of a flat, but the point elongates your leg and creates a very classy look! Love the polka dot loeffler randall ones! I absolute love pointy toes, but with my 8 1/2 shoe size they need to be “round enough” with “enough of a point” at the same time to really satisfy me. I found my first pair a few weeks back at Zara and love them to pieces. If only they were real leather..
Anyways, if I am lucky and see any of these pairs in shops I will be sure to try them on, all of your picks are beautiful! The polka dot Loeffler Randalls are perfect, of course! Ballet flats are definitely a great staple!! I am swooning over the Loeffler Randall polka dot pair but I just can't pull the trigger…they are gorgeous!! I just scooped up the Leopard Steve Maddens though and they are adorable…run big though! great picks! the polka dots and stripes are my favorite! Super cute picks! Loving the Steve Madden's! i love them…thanks for adding the price too! i hate when i click on a link to a pair of shoes on a that i see and love only to find they are wayyy over my pay check! aw man i want all of these! fueling my online shopping addiction… crap. I have the Steve Madden pair in black, and they KILL my feet. Great selection of flats. Love the Ann Taylor ones. I'm obsessed w that polka dot pair, I have them pinned and keep wanting to pull the trigger! Magnificent submit, very informative. I ponder why the opposite experts of this sector don’t notice this. You should continue your writing. I am sure, you’ve a huge readers’ base already!|What’s Going down i am new to this, I stumbled upon this I’ve discovered It positively helpful and it has aided me out loads. I’m hoping to give a contribution & assist different users like its aided me. Good job.